One of my favorite things about summer is grilling fish. I love the flavor that grilling emparts to fish. 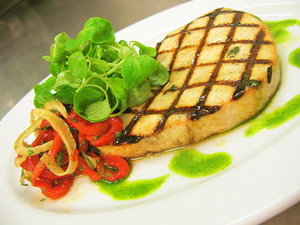 Of course meaty fish like swordfish is much easier to handle on the grill than thinner more delicate fish. One piece of equipment we use often during the summer is a non-stick grill basket. I use it for cooking fish and vegetables and chicken on the grill. This recipe is courtesy of Jacquelyn G. Legg, Words Worth Eating, which was distributed by Graul's Market. Brush the cooking area of the grill with corn oil. Combine sauce ingredients and set aside. Place steaks on the grill (or place steaks in grill basket on grill). Brush with sauce. Grill over a medium-hot to hot fire for 5 to 7 minutes. Turn and brush with sauce again. Cook an additional 5 to 7 minutes. * Top with garnish and serve. * Fish is done when it flakes easily when touched with a fork.